Over the past six months I've been working with online stationery company, Bureau Direct to bring you new ideas and inspiration from their virtual shelves. It also basically meant that I could indulge in all things stationery-related without having to make excuses. As a blogger it was probably one of the best ambassador and review opportunities I've ever had which goes to show that it's not always about the money but finding a good blogger/brand relationship. Over the weekend, I created a few stationery-themed YouTube videos. I've linked these below with a bit of an intro to each of them. I hope you enjoy them. First, I talked about the limited edition Ambition set of Field Notes notebooks (from Bureau Direct) which I'd been eyeing up for about three months. I already knew that I wanted to use these as a daily journalling system instead of carrying my Filofax around all the time (the job I'm currently doing doesn't need me to diary note an awful lot of appointments as I'm very much desk based now) but I needed a notebook cover. I had seen a couple of handmade notebook covers that I knew would do the trick but got mixed up between Hobonichi (or Fauxbonichi when it's a copy) and Midori (Fauxdori) even though I knew how I wanted my notebooks to "sit" in the cover. 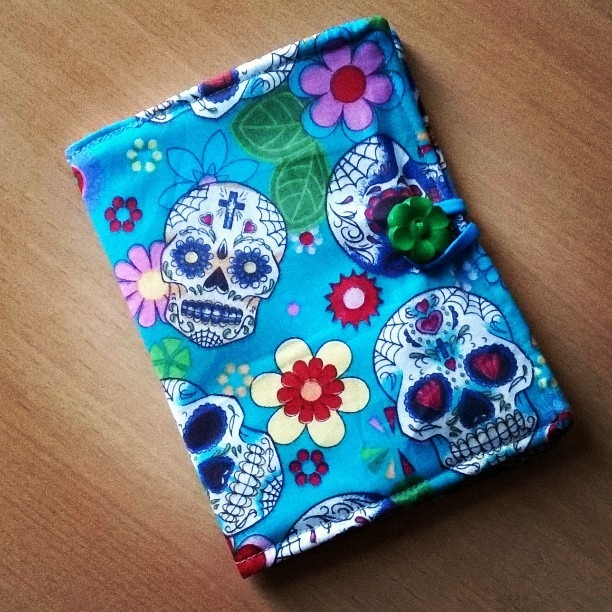 Anyway, I commissioned a gorgeous hand-made fauxbonichi cover from Masters and Matthews on Etsy in a candy skull material which works in exactly the way I want it to, however, if you watch the video you can see that the fauxdori style of notebook cover may be more fitting. I'll just have to save up some pennies and order another cover in the future. Watch the Filofax, Field Notes, Faubonichi video here. Next I unboxed another of the monthly stationery boxes from Anna Brim (aka Mrs Brimbles). This is a new venture for her this year but, as a fellow lover of stationery, she knows exactly what people look for in a stationery box subscription. Each box does follow a theme (February was the month of love, March was Spring/Easter related, April is all about April showers and ducks... you get the drift) and I will be including this monthly subscription in a review on Stationery Lovers later this month. It's easier to watch the video than list what is in the box. You can find Anna on Twitter and Instagram as @MrsBrimbles and please do visit her blog/shop to sign up - you can try one box every so often or have a rolling monthly subscription. Finally, I asked friends on Twitter and Facebook if they had any burning stationery questions they wanted to ask me. These ranged from wanting to know why stationery was so called, to my three favourite stationery brands and why stationery gets me so excitable. Watch my Stationery Q&A here and if you have any other questions to ask me just let me know. Even though this is the last month of my "working" relationship with Bureau Direct, it most definitely isn't the end. In fact, it's probably very much the beginning (but with just a little less enabling). You can find all my previous Bureau Direct / Stationery Wednesday posts here.